When your opponent activates a card that includes the effect of making your opponent discard from his/her hand (this does not include the cost of discarding cards), you can activate this card by disca..
You can only have 1 face-up "Gravekeeper's Chief" on your side of the field at any time. As long as this card remains face-up on the field, your Graveyard is not affected by "Necrovalley". When you Tr..
Offer 1 card that includes "Gravekeeper's" in its card name on your side of the field as a tribute to inflict 700 points of Direct Damage to your opponent's Life Points. 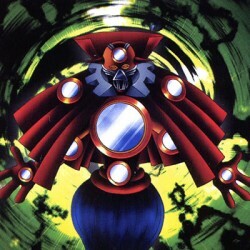 However, you cannot offer this..
You can activate this card's effect only when "Necrovalley" is active on the field. When this card attacks, you can change the battle position of 1 face-up monster on your opponent's side of the field.. When you Normal Summon this monster and during each of your following Standby Phases as long as this card remains face-up on the field, select 1 Set card on your opponent's side of the field and see i.. Discard this card from your hand to the Graveyard to make the damage inflicted to monsters that include "Gravekeeper's" in their card name 0 until the End Phase of the current turn. However, the damag..
FLIP: Place 1 "Poisonous Snake Token" (Reptile-Type/EARTH/3 Stars/ATK 1200/DEF 1200) in Attack and Defense Position on your side of the field. When the Poisonous Snake Token is destroyed as a result o.. This monster is not destroyed as a result of battle at any time, although damage calculation is applied normally. When this card is specifically designated as the target of the effect of a Magic, Trap..
"Spirit Reaper" + "Nightmare Horse" This monster is not destroyed as a result of battle at any time, although damage calculation is applied normally. When this card is specifically designated as the t..